Fab Five Promise a More Diverse Season of "Queer Eye"
Leave it to Mindy Kaling to tweet the truth. 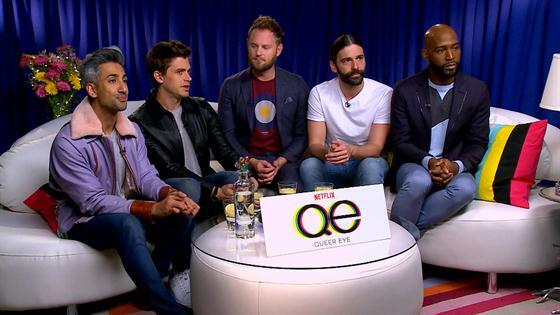 "I'm gonna say what we're all thinking: whoever cast the @netflix #queereye did an incredible job," she wrote on June 24. And we couldn't agree more, along with the rest of the world as it seems everyone is obsessed with Netflix's Queer Eye, the revival of the iconic series that has introduced an all-new Fab Five. In less than a year, Karamo Brown, Jonathan Van Ness, Antoni Porowski, Tan France and Bobby Berk have gone from virtual unknowns to overnight pop culture sensations. And Danielle Gervais (the senior vice president of casting & talent at ITV America) and Gretchen Palek (the co-president of Leftfield Pictures), are the two women responsible for finding the Internet's five new bingeable best friends. You're welcome, Mindy! "There was a lot of pressure," Palek told E! News of the search for 2018's Fab Five. "That's the beautiful thing about casting, if it doesn't work we're first blamed! We understood how important it was." Though Gervais and Palek learned of the project in the summer of 2016, the hunt for their five stars couldn't really begin until early November. And there were two big issues once their global search was officially underway: They couldn't say it was Queer Eye or that it was for Netflix. "We really had to be proactive in the way that we were finding people," Palek said. Our strategy is always to see as many people as possible and make sure there was strength in each individual vertical." But finding qualified candidates was no easy task, as Gervais explained, "When you want people that are true masters of their craft and people that have the credentials we were looking for it's always tricky to try and convince them to do a show that they don't know is Queer Eye. That's always a challenge for us." While the five men ultimately selected were relatively unknown before the series, there were conversations about whether or not to cast a famous name. "There were some famous men that certainly we were thinking of and through the process just didn't make sense," Gervais said. "A lot of conversations of whether or not to go with people who were already known or really discover people and help them grow together as opposed to inserting a star amongst the other four. We looked at everyone." After narrowing their search down to about 25 men for each vertical, the finalists were sequestered in Glendale hotel for an intense five-day boot camp of sorts. At first, improv sessions (jumping jacks included) and individual interviews were conducted with the casting team, producers and senior executives from Netflix, ITV America and Scout Productions (Scout's David Collins created the series). As you can imagine, it was "trickier" than anyone could've anticipated. "They were all sort of breaking off and it was almost like herding cats at one point because they were all so adorable and successful and charismatic that they all just started to take over the hotel." To help hone in on which men truly had the chemistry they were looking for, they decided to put them in groups of five for fish bowl questions—looking for a very specific quality. "Not only who gelled but who gave people the room to speak," said Gervais. "Don't forget, it's five people all having to do this dance, even in series, and giving someone the spotlight, there's a skill in that. [We] especially were always looking for people who obviously could dig deep and come from these experiences and who looked great together, but also who allowed others to talk. And of course, who just got along." Palek and Gervais both remember the moment they knew they found their five guys, even recalling the order in which it happened. "I remember seeing Bobby and Karamo in a group together, hitting it off. I remember seeing them go arm-in-arm to the bathroom at one point, chatting it up," Gervais recalled. Two down, three to go. Next, Antoni was brought in, followed by Tan. Jonathan (or "JVN") was the final piece. "We brought him in last. He had just done another group. We did more fish bowl questions," Gervais recalled, "and at that point I remember getting goosebumps and saying, 'This group, they just work.'" Palek said, "It's almost like you're watching TV during these things. And we didn't want to turn their channel and that's when you know you have something special. That's chemistry. That's connection." Before the final decision was made, the Fab Five were tasked with one last mission: completing a transformation on a person and house that wasn't staged. "We didn't tell them anything in advance and they showed up the house. They had only known one another for a couple of days, so it was going in there blind," Palek said. Antoni made due with a mostly barren refrigerator and cabinets. (He made a steak and he did it really well, thank you very much.) Tan found some "interesting" things in the closet. Bobby was tasked with making design magic. Though they were confident they found the right group of men for 2018's Fab Five, Gervais and Palek couldn't predict just how much of an impact they would have after the revival premiered in February 2018. "I don't think we could've anticipated in any way, shape or form the reaction that it's gotten. For us, what we did understand was the important of finding the perfect five in the year of 2018 to represent such an iconic brand. We felt the weight of the world on our shoulders," Gervais said. "How do you replace the Fab Five that started at all? The truth was I don't think we were out to replace them or outdo them in anyway. It was 'what is the evolution of the series in 2018?' and we feel like proud mamas that they have just taken it and flown." Yes, Palek and Gervais know some people on the Internet think Antoni can't cook. "I know he's taken a little flack for some of the recipes that are simpler," Gervais said, "but he really thinks about a recipe that makes sense for that person." So no, he's not going to teach a cop how to make flan. "He wants to teach people stuff they can actually do." Before the chemistry test portion of the casting process, Antoni had a Skype interview and proved to deftly handle the task of cooking while conversing. "I specifically remember not only in his initial tape that we put together, which involved a Skype interview, we actually included a lot of his cooking in his kitchen. It's tricky to not only be able to cook the recipe, but also hold a meaningful conversation while doing it," Gervais noted. "From day one, we just said he's it. He is it." "If anybody has to work every episode, it's him," Palek said of Bobby, who launched Bobby Berk Interiors + Design in 2006. "What he's able to do, he has such vision and he does it in days. He has such little time. And talk about somebody who cares. It's never a boring space. He wants to integrate family photos and make it special." And little did Palek and Gervais know that Bobby had the flu during the most intense part of the casting process, with Palek saying, "He would never be the type to say that. There's never a complaint." From the moment the hairdresser and Gay of Thrones web series star walked in, the casting team knew he was a star. We know, you totally can believe that. "I will never forget this. He had the grooming case with the handle that popped out, and he kept calling it 'She.' He's like, 'Yeah, She comes with me everywhere!'" Gervais recalled. "He was just light. And what I loved about him, obviously he's so high energy and so freaking hilarious, but one of the things we noticed right off the bat is he always gave everybody room to speak. He was so gracious. And his freakin' comedic timing was spot on. He is a brilliant comedian." But what really sealed the deal? "He also does a wonderful scalp massage," Palek joked. Definitely the "trickiest" vertical to define, Gervais and Palek were looking for someone with "a wide array of experiences" to help connect with their heroes. They found just that in the former Real World star. "We always needed to identify someone who knew could have that chemistry with people, a natural comfort with different types of people," Gervais explained. "Granted, all five have to have that, but there's almost a psychology behind the culture piece of this. Karamo, just from day one, he was confident, he just knew himself, and he knew what he was about. He just embodied the role." She continued, "He digs deep for every single episode and he relates to people." While all of the guys had initial hesitations about being part of a revival of such a beloved series, Tan, who is based in Utah after founding a women's clothing line, "needed a little more convincing," Gervais noted, "because he had not done TV before and was successful in his own right, but I think once he talked to us and the producers, he understood the message we were trying to get across." Palek added, "Tan is really special and there is an energy that he brings into a room. You just want to know who that is." And now, thanks to Queer Eye, we do. Queer Eye is currently available to stream on Netflix.